Notable Contemporary Relatives of Robert O. Vandercook Abstracts by Paul Moxon with genealogical research by Linda Wilbur (double Vandercook family descendant and family historian) and Ronald D. Bachman (a great-great-great grandson of Michael S. Vandercook and author of the biography A Fine Commanding Presence The Life and Legacy of Maj. Michael S. Vandercook (1774–1852) of Pittstown, Rensselaer County, New York, privately published 2010). H.A. [Hale Asher] VanderCook (1864–1949). Composer and founder of VanderCook Cornet School in Chicago 1909, now the VanderCook College of Music. In the 1880 Michigan census, he was listed with his family at the age of 15 as a “learning printer.” Third cousin to R.O Vandercook, with Michael VanDerCook (1715-1786, husband of Cornelia VanNess) as their common ancestor. H.R. [Henry Russell] Vandercook (b. March 1851 d. December 9, 1915). 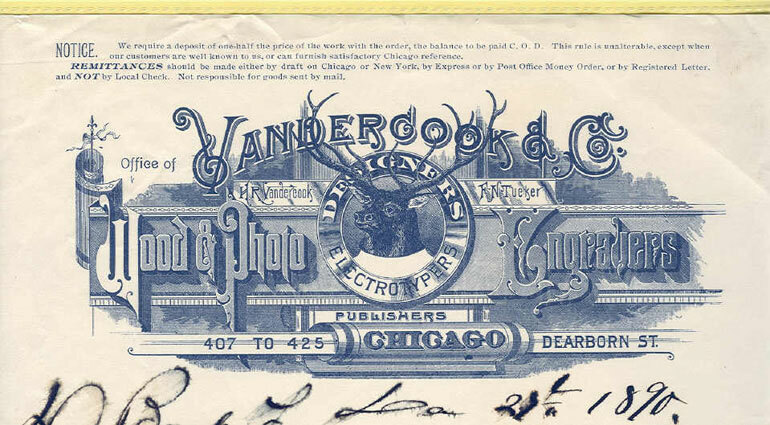 A partner in the Chicago printing company Vandercook & Co. No mention of R.O. having worked there has been found in any publications or documents. Son of C.R. Vandercook. C.R. [Charles Ranney] Vandercook was a son of Michael S. Vandercook and his second wife, Sally EDDY. Robert O. Vandercook was a grandson of Michael S. Vandercook and his third wife, Betsey ROBERTS (Pickett). Although their fathers were half brothers, that would still make H.R. Vandercook and R.O. Vandercook first cousins. Major Michael S. Vandercook (1774-1852) Subject of the biography A Fine Commanding Presence (2010) by Ronald D. Bachman. John [Filkins] Vandercook (1873–1908). Editor of the Cincinnati Post, who in 1905 directed the newspaper’s campaign for municipal reform. In 1906 he became a founder and first President of the United Press Association. His book The Complete Revolution (1909) was privately published after his death at age 35 from appendicitis. See George Edward Stevens’ thesis A History of the Cincinnati Post (1968). Father of author and radio commentator John W. Vandercook. Second cousin to R.O Vandercook, once removed, with Simon VanDerCook (1749-1829, husband of Fevine VanDerHoef) as their common ancestor. Great-great grandson of Peter Vandercook (1790-1875). [M’Lissa Kesterman of the Cincinnati Historical Society Library also contributed information to this entry]. John W. Vandercook (1902–1963). Son of John F. Vandercook and Margaret W. Vandercook. Author of 14 books in a wide range of genres (mystery, biography, travel and science fiction). An expert on the South Pacific and the West Indies, his bestselling biography Black Majesty: The Life of Christophe King of Haiti (1928) was illustrated by Mahlon Blaine (as were several other titles). John Vandercook’s novel Murder in Trinidad (1933) was made into a film the following year and starred Nigel Bruce (best known for playing Dr. Watson in The Hound of the Baskervilles). In 1940 he became a correspondent and commentator for NBC radio. (Hear his pool report Reaction to the D-Day Invasion). Second cousin to R.O Vandercook, twice removed, with Simon VanDerCook (1749-1829, husband of Fevine VanDerHoef) as their common ancestor. Margaret [Womack] Vandercook (1876–?). Author of the popular Red Cross Girls, Ranch Girls and Campfire Girls series books. Wife of John F. Vandercook and mother of John W. Vandercook.